Schedule your free introductory class! We offer lessons with university-trained music teachers with tons of performance experience. CCM instructors are friendly, professional, and dedicated to learning about your musical goals to help you achieve them. Students are invited to participate in performances at the school, participate in supplementary group and ensemble music classes, and use music to interact with the community. Recently, students performed at the Omni Foundation Concert Series in San Francisco and the Guitar Foundation of America's Convention in Los Angeles. 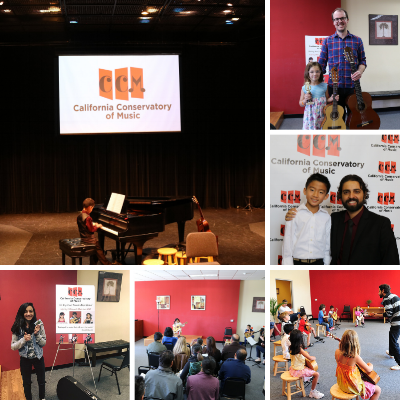 Owned and operated by musicians Robert Miller and Christopher Mallett, CCM has provided quality music education to the Bay since 2011. We have assembled an amazing team of music teachers and performers who believe in the power of music! Students at The California Conservatory of Music constantly have goals to work toward, from monthly music practice challenges to graduating to a new book and performing in the annual graduation concert. Consistent goals help to incentivize their practice! Since 2011, a goal of The California Conservatory of Music has been to instill in students a passion for music that will last a lifetime! Students from our music school have won numerous competitions, performed outreach concerts all over the world, and have gotten into some of the best colleges in the United States. Our Santa Clara location is right off of Highway 101's Great America Parkway exit and is easily reachable from San Jose, Santa Clara, and Sunnyvale. Our Redwood City location is on Woodside Road, between Highways 101 and 280. This location is easily accessible for students in Redwood City, San Mateo, Menlo Park, and Palo Alto.